DULUTH, MN. — According to our calendars, autumn has officially begun. If you look to the skies, there are some undeniable signs that the season is changing. 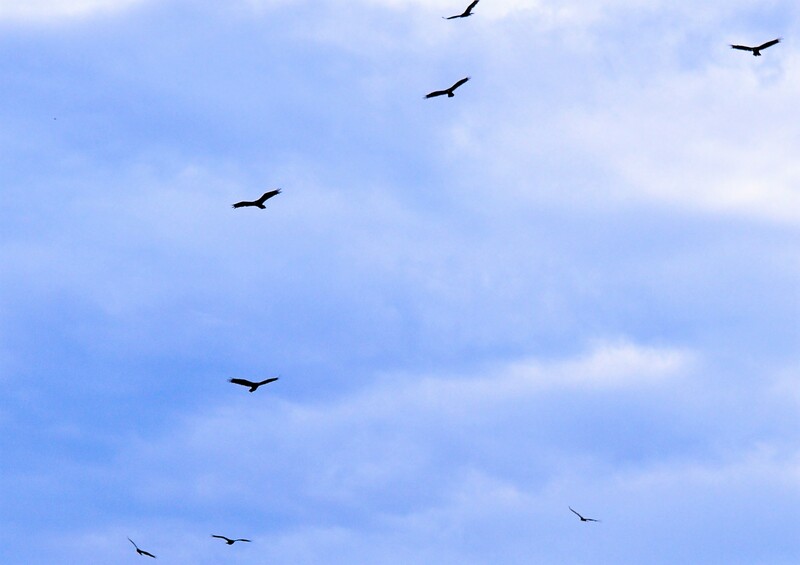 In America’s North Country, the annual raptor migration is in full swing. 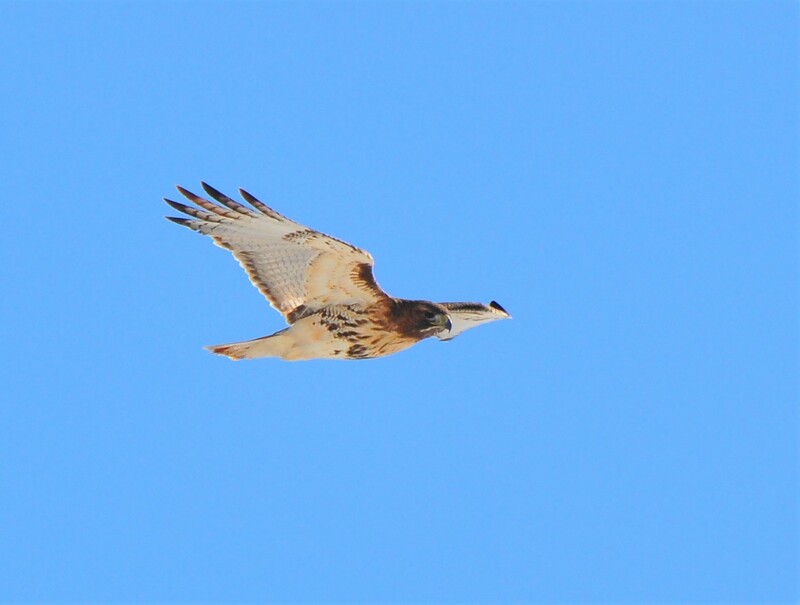 Although the grand passage can be viewed from a variety of locations, there is no better place to witness the winged spectacle than in the famous Hawk Ridge region of Lake Superior’s northern shore. Lake Superior is the world’s largest freshwater lake. Roughly the size of Austria, the lake contains enough beautiful, crystal clear liquid to entirely cover all of North America and all of South America with a foot of water. Yes, you read that amazing fact correctly. With a length of 350 miles and maximum width of 160 miles, it’s no wonder that migrating birds would rather go around than go across Superior’s watery expanse. For birds streaming southward from boreal Canada, Lake Superior’s north shore presents the Mother of all Roadblocks. 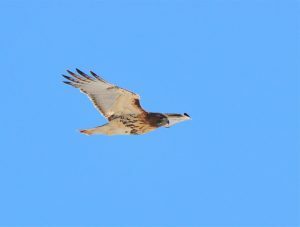 Taking an immediate right-hand detour, migrating hawks and other birdlife pour down the angling shoreline in daunting abundance. The fall migration is indeed a sight to behold. 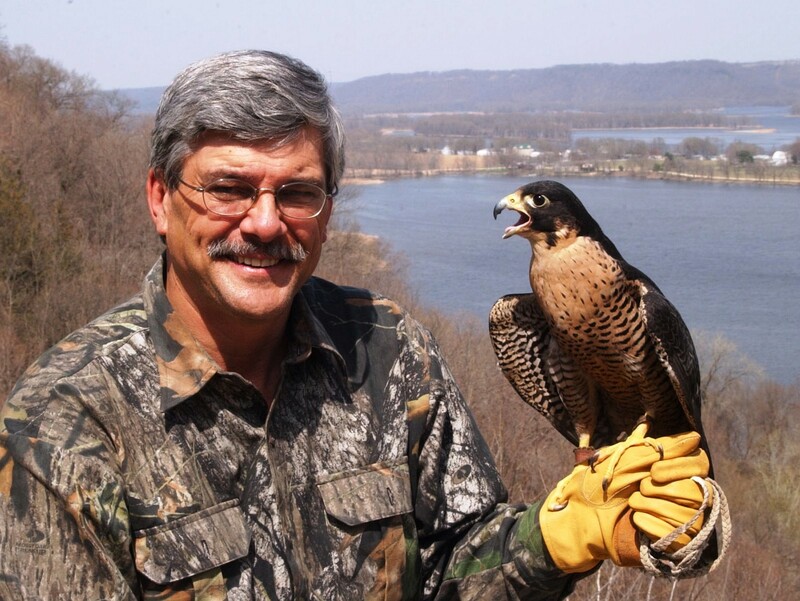 When Superior area Hawk Head, Jeff Steadman, invited me to join him in observing the event last week, I lost no time in pointing my vehicle due north. 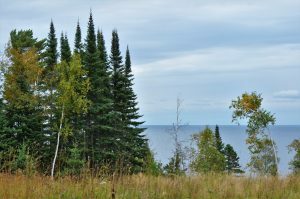 Arriving at Jeff’s deep woods cabin late Friday, I was just in time for a hearty meal of Minnesota wild rice stuffed brats – a popular local taste sensation that must be sampled to be believed. I was also in time to witness the season’s first hard freeze. I’m not sure how low the temperature actually dropped, but it was enough to put hard ice on truck windshields and shallow puddles. The stage was set, we speculated, for a fantastic migration the following morning. Turned out that our assumptions were correct. 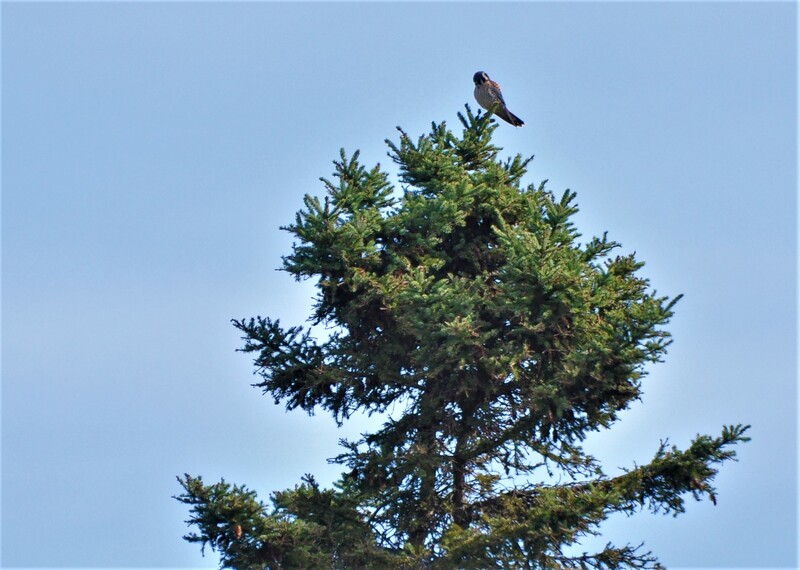 After setting a blind at the edge of a small, forest shrouded meadow above the shoreline, we began seeing the first passing hawks and falcons shortly after daybreak. The early show was largely dominated by sharp-shined hawks and merlins. Both species are early morning hunters and will often have the day’s first meal under their belt by the time the sun is fully visible. It quickly became apparent that we had obtained a ring side seat to the main event. Amazingly, were able to witness two successful hunts as these highly efficient raptors seized a junco and another [unidentified but apparently tasty] passerine. As the morning continued, more and more raptors appeared as warming air and the day’s first thermals provided enhanced lift. The number of birds steadily increased as bald eagles, red-tails, osprey, Cooper’s hawks, vultures, broad-wings, kestrels, and an endless supply of fast moving sharp-shins made their appearance. 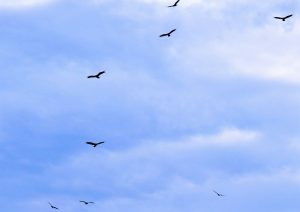 Countless birds stacked up overhead, as hawks and eagles used rising air currents to soar to heights beyond the range of my 10-power binoculars. I could only imagine how the landscape must have looked to the hundreds of migrating raptors who had ascended to such dizzying heights. 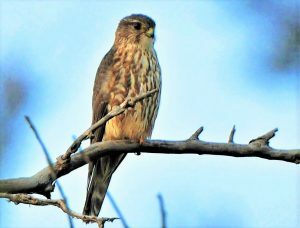 Day of the Merlin: But as amazing as those high fliers were, it was the low altitude, mass migration of merlins that ended up stealing the migratory show. The hard freeze had really put merlins on the move and the flight was virtually nonstop. We often had two or three of the pigeon-sized falcons in sight at one time, and there was hardly a minute when at least one merlin was not in close view. The all-day migration was a thrill to observe; and I saw more merlins in two days than I’ll probably observe in Iowa during the rest of my life. Merlins are extremely maneuverable, ultra-spectacular, high speed fliers. They love being on the wing and they always have energy to burn. For traveling merlins, each and every meal comes at the conclusion a dramatic high velocity chase. Tremendously efficient; they catch prey species like larks, juncos, sparrows, and doves at will. Whenever a merlin sets its sights on a specific meal, it’s a virtual done deal. The targeted bird might just as well lay down and die, because that’s likely what it’s going to do within the next few seconds anyway. Merlins are just that good at what they do. The only birds that have a chance at all are the ones merlins chase just for sport, which they frequently do. Final Thought: I’m not sure how many total raptors [of nine species] we observed during the weekend, but the count would easily go into several hundreds. At the nearby Hawk Ridge Bird Observatory, official end-of-September counts ran from around 1,500 to more than 2,600 raptors per day. 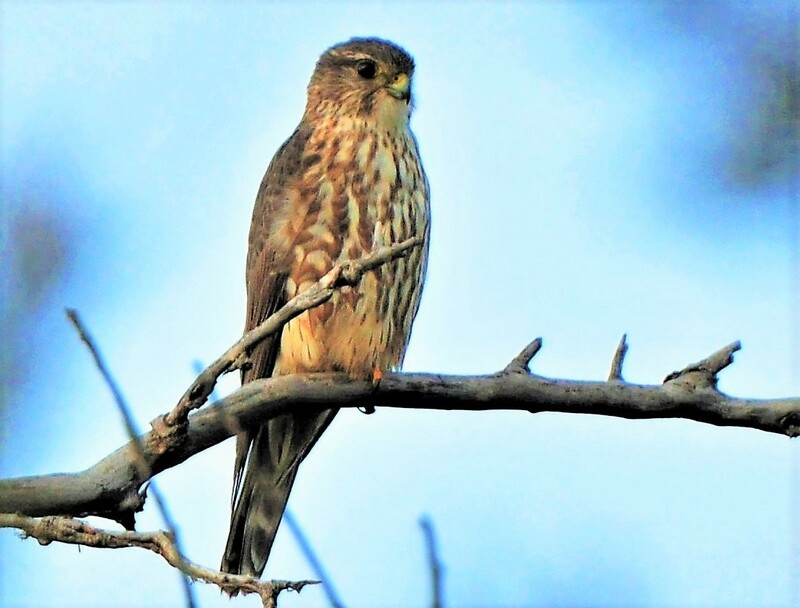 Although Hawk Ridge tallied impressive numbers of broad-wings, sharp-shined, and others, they saw noticeably fewer merlins. Abandoning the high ridges, merlins prefer to follow and hunt the shorelines, and they had certainly proven it on this occasion.